Hi Jason. 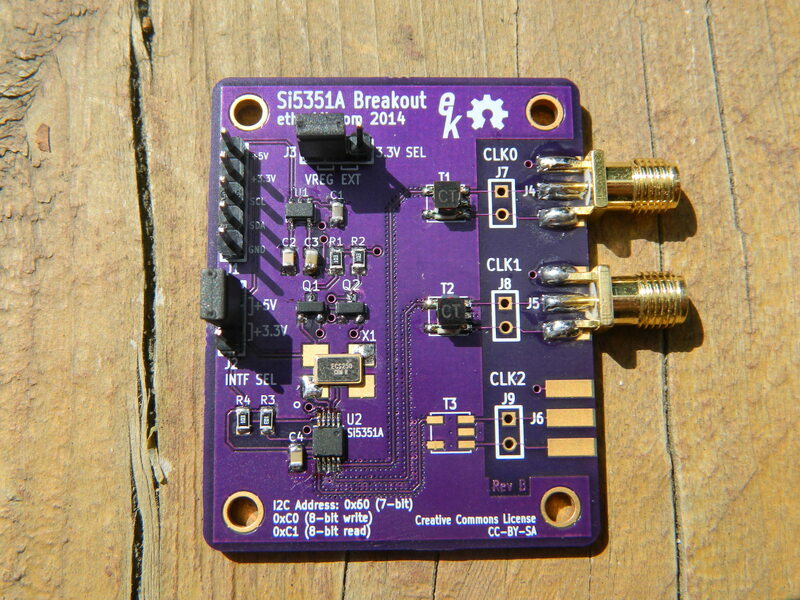 I’m thinking of using your breakout board with an RTL-SDR dongle. I’m just wondering if there’s an easy way to convert the square wave output to a sawtooth one, since that seems to be the wave form of the clock used by the R820T based dongles. I remember to have seen such a conversion circuit in the past but I’m not sure if it is something doable at 28.8 MHz … I admit to be almost a newbie…. 🙂 Do you have some suggestion or could you point me to a schematic or to some knowledge resource? …just an additional piece of info: if you look here http://gnuradio.4.n7.nabble.com/dual-coherent-channel-rtl-sdr-td43784.html you will see a sentence that states “The clock looks sawtooth-like on the scope.” and there is some considerations about the clock being sawtooth vs square…. I think it’s tricky to turn a square wave into a sawtooth wave, and I can’t think of a method to do it off of the top of my head. It’s easy enough to get a triangle wave from a square wave using a high-speed op amp integrator, but the sawtooth is another beast all together. What I don’t understand is why you need a sawtooth wave when substituting an oscillator for the stock crystal on the dongle. The crystal is going to make a waveform more akin to a square wave or sine wave than a sawtooth. If a sawtooth is needed, I would think it would have to be generated after the 28.8 MHz oscillator. I wonder if the people making measurements aren’t introducing some kind of loading which is giving them a strange looking measurement. i agree. I was just unsure about that topic (I’m not an expert) : I will try with square wave and see the tuner behavior…Thanks ! I tried to use a ECS-250 crystal with your new board and it caused the 3.3v line to short. It took me a while to figure out that the new board was designed for the FoX924B. I ended up cutting the traces around the pad that connected to 3.3V and jumpering the 3.3V to pin one of the Si5351A. The opposite sides of the ECS-250 that are not the crystal connectors are shorted to each other. Thanks for the report Tom! I used the ECS-205 on the Rev B board that I built and it worked fine, but I did not solder the unused pins to the board, so I wonder if that makes the difference. I’ll look into this further when I get some more parts on hand! 1. How did you determine the dimensions for the 50 ohm traces on the board? When I use the coplanar waveguide with ground plane calculator, your dimensions don’t give me 50 ohms. The results I get with your dimensions is about 88 ohms. 2. Your stitching on the ground plane next to the traces uses 6 mil drill size. OSHPark specifies a minimum drill size of 13 mils. Are they actually ok with 6 mils? 1. In the KiCad transmission line tool, if you select Coplanar Waveguide with Ground Plane, select an H of 1.6 mm and a trace width of 1 mm, it should come out around 51 ohms. I had some experienced microwave folks double-check me on this, so I’m fairly certain it is correct, but let me know if you still get a conflicting figure. 2. That’s probably an oops on my part. I’m guessing they just used the smallest drill size they had, as I received no report of a design violation when they accepted my Gerbers. Thanks for the response, Jason. I was looking at the pcb layout file for your rev B board. It has a trace width of 0.20 mm. But I see you now have a rev C with a wider trace. 1 mm does give me 51 ohms.